The BBC marked Holocaust Day 2015 by showing the nine hours of Claude Lanzmann's Shoah over consecutive Sunday evenings. I had seen the film almost thirty years before when Channel 4 showed it in full with, as a mark of respect and good taste, a placeholder instead of ad breaks. The decades haven't erased memories of steam trains, lush Polish meadows and crease-faced locals nonchalantly recalling a time when there was a death camp on the doorstep. So why did I watch it all again, hour after hour? Certainly there is a mesmeric quality. Lanzmann dispensed with overt narration, dramatic re-enactment, period footage and photographs to concentrate on interviews with survivors and ex-guards, sometimes in formal settings, sometimes in cafés, sometimes accompanied by slow tracking shots over forest clearings. You wait as answers are given in Polish, German or Hebrew and then repeated in French, which is when the subtitles in English appear. Perhaps it is the patience this demands that allows for a certain ease to extend between you and the terrible stories being told. Until, that is, a farmer in the village of Treblinka repeats the cut-throat gesture he made to those arriving in cattle trucks. The gesture erases time and space: this man's finger going across this man's throat was seen by those inside desperate to learn their fate. While there is nobody to describe it from their angle, there you are, the viewer, trapped in this a moment of impossible proximity. You wait for something to emerge and imprint itself on the landscape. As nothing ever does, why do we watch? Perhaps the answer is plain Schadenfreude; a horror film thrill from a safe distance. There is of course the alibi of knowledge, and we might make the claim that Shoah helps us to remember that such events came to pass in otherwise bucolic pastures, in an otherwise civilised society, and so helps to maintain vigilance in our own. But this is a retrospective if not disingenuous reason when, apart from Raul Hilberg's brief analysis of Nazi bureaucracy, the film presents only the spoken words of survivors, with all the hesitations and struggles common to one-sided interviews. Shoah tells rather than shows. Or, rather, if something is shown, it appears in those hesitations and struggles, in those peaceful woods and meadows, and our knowledge is embedded in the experience of listening to a single person in their struggle to speak; an experience of distance rather than of the consumption of facts downloaded for future use. The film thereby submits itself to the domineering rhetoric of those who aim to debunk testimony, and indeed within seconds online you can find hectoring accusations directed one survivor in particular. This great weakness is its great strength. Repeated listening does not so much reinforce belief in the facts related by the survivors as heighten sensitivity to what is being communicated, which might not be so readily accommodated. At least one question is raised from this conclusion: is the experience of watching Shoah uniquely dependent on sight, sound and enduration? That is, how might a form such as the novel create similar demands and effects on a reader when, in contrast to the form of Shoah, control and unity are considered key to its success and value? The question might at first appear arbitrary or naïve, but the consequences for the novel are profound. The plea to listen to what escapes accommodation is central to Ethical Loneliness, Jill Stauffer's study of testimony. While its principal focus is commissions of national truth and reconciliation, a key example of the failure to hear is taken from Yale University's video archive of holocaust testimonies. Hanna F. is interviewed twice and, in the first recording, describes how she felt alone in the world after twice tricking her way out of Auschwitz. Sadness weighs heavily on her words so, perhaps to counter the mood, the interviewers call her 'plucky' and appear to dismiss her own response that it was stupidity rather than bravery that saved her. It takes another interview seven years later for her to explain what she meant: it was blind hope that someone else from her family would also survive and be reunited with after the war. She was able to take chances to escape only because of that single hope. But there was no one left and it had been stupid to think otherwise. Being plucky and brave led to nothing but being alone in the world. Stauffer writes that the interviewers' natural assumption of a redemptive feature thereby misses "a deep source of harm that no amount of time, love, or justice could fully repair". Despite this, at the end of the second interview, Hanna says she "unloaded a bit", for which she seemed grateful. Noting the patience of the second batch of interviewers, Stauffer concludes that if hearing is meaningful "it has to be embedded in an openness where what is said might be heard even if it threatens to break the order of the known world for those who listen". This is the break each victim has endured and struggles to repair, and which accounts for the patience necessary to the form of Shoah. Stauffer frames this particular experience of loneliness in Levinasian phenomenology, his ethics as first philosophy. Loneliness is a revelation that the formation of the autonomous self depends on the cooperation of the other person in every encounter, and the revelation occurs only when that cooperation is withdrawn. For another victim of the Nazis, Jean Améry, the first blow in the prison dungeon revealed that his previous acceptance of what torture might mean was merely rhetorical. The clubbing by his Gestapo torturers was the moment of revelation. Common humanity became what Améry calls a "codified abstraction". He discovered that torture dehumanises the victim more than it does the torturer. This is what Stauffer means by 'ethical', as the victim experiences an ontological loneliness, something more fundamental than injustice. And it is not just physical torture: she describes how prisoners held for years in solitary confinement are afflicted by hallucinatory paranoia due to a lack of human contact. The lonely individual must then seek to regain trust in humanity from "a place of utter silence" and an acute awareness of how easily the fiction can break down. The difficulty in doing so was compounded in Hanna F's case by not being properly heard precisely by those whose aim was to listen. Ethical Loneliness is particularly aware of the ironies involved in patching the exposed fiction – the first being that "institutions aiming to adjudicate loss may impose loss of a different kind". As Hanna F's also revealed, there is an asymmetrical relationship so that often when "a speaker speaks in an institution designed for hearing...an audience empowered to listen hears something other than what she says". Repairing the damage thereby unwittingly shores up the system that inflicted it in the first place. Stauffer suggests replacing the notion of culpability with "the duty to respond or to be responsive" within the relationship in order for other possibilities to present themselves, which might be as basic as making room for what is lost in such a communication, perhaps such as expressed in Walter Benjamin's observation that friendship is not the abolishing of distance but the bringing of distance to life. This is certainly the possibility of Shoah, in that the speakers are given time to speak at length in their personal space. But what does it mean for what is assumed to be the great civilising art form of what Steven Pinker calls the Humanitarian Revolution? That is, the one raised at the beginning: the institution of the novel? While this is outside the scope of Ethical Loneliness, here is a form also empowered to listen within a relationship that is asymmetrical in a similar manner. In a chapter of his book The Better Angels of Our Nature, Pinker cites a study that suggests the humanitarian reforms of the 18th century were preceded by the rise of literacy and the reading of realistic fiction. Novels with "characters unlike oneself exercises the ability to put oneself in other people’s shoes, which turns one against cruel punishments and other abuses of human rights". Uncle Tom’s Cabin mobilized abolitionist sentiment in the United States, Charles Dickens’s Oliver Twist (1838) and Nicholas Nickleby (1839) opened people’s eyes to the mistreatment of children in British workhouses and orphanages, and Richard Henry Dana’s Two Years Before the Mast: A Personal Narrative of Life at Sea (1840) and Herman Melville’s White Jacket helped end the flogging of sailors. In these examples, a writer is also someone sitting on a truth and reconciliation committee listening to testimony from the floor in order to produce a report with a view to enabling peace and justice. To write a novel then is an enterprise of humanism. Martin Amis' defence of the novel in general and his novel set in Auschwitz-Birkenau in particular rests on this civilising potential, and in his interview with Michael Silverblatt he cites Pinker's book as evidence that "the world is becoming less violent" partly because of the novel. The first thing to note here is that Pinker's examples all come from 19th Century and are novels written about subjects close to each author's home, and he goes on to quote 20th Century examples that are written by authors with similar proximity to their subject matter. So Amis' choice to focus on real events over 70 years ago in a different continent seems peculiar given this defence. His recent books about Stalin and the Gulag confirm the impression. Aren't there ongoing scenarios in the world more demanding of our attention? Silverblatt and Amis agree however that the holocaust is 'the tone of our times' and stands for other 'adventures of ethnic cleansing', with the examples offered being notable for its circumspection. I'll come back to this, as Amis mentions that a theme in the memoirs of holocaust survivors and perpetrators is that each of us is unaware of what we are capable of, whether that is resilience in Hanna F's case or evil in the case of Franz Suchomel, a guard drafted to Treblinka who complained in Shoah that the soldiers lacked proper winter clothing. The tone of our times does indeed seem to be the frightening ease with which normal, decent people assent to the first blow against the prisoner and remain not only unaware of what they're capable but oblivious to what they have already accomplished. Amis is troubled that "something quite supernatural happened in Germany...the most educated nation that [had] ever been" undertook this "pedantic exploration of baseness". There are times, he says, when the value of human life collapses (using the Russian Revolution as an example rather than, say, events in California where the interview took place) except in Germany he thinks there was something extra in which "death ... appeared and got going and seemed to gather its own momentum". He points out that while the holocaust was meant to be self-financing – evacuees paying their train fare to Auschwitz, their bones ground for fertiliser, POWs used for hard labour – an "Aztec hunger for death" overwhelmed the bureaucracy and became a drain on the war economy. This goes someway to mitigate the safety of hindsight in his recent work because this suspicion does justify a more imaginative study of this sudden inversion of civilisation. It is revealing then that Amis goes against his own current and says ISIS would be an equivalent if it "got going on a vast scale". But why this sudden leap into the future when the past has been the dominant focus and there are plenty of examples closer to home and closer indeed to Auschwitz-Birkenau, ongoing on a vast scale? Steven Pinker's book and its claim that “we may be living in the most peaceful era in our species’ existence” has received high praise from people in high places, such as Bill Gates, who chose it as his book on the BBC's Desert Island Discs. 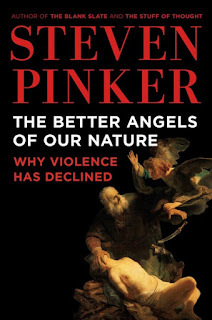 However, Edward Herman and David Peterson note that Pinker’s "lovable theme" coincided with his nation's engagement in wars "on at least four separate continents". 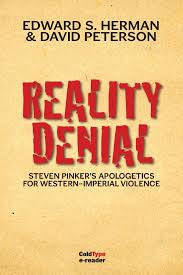 Whereas in Pinker's view there has been a “Long Peace” since the end of the Second World War, in the real world there has been a series of long and devastating U.S. wars: in the Koreas (1950-1953), Vietnam, Laos, and Cambodia (1954-1975), Iraq (1990-), Afghanistan (2001- or, arguably, 1979-), the Democratic Republic of the Congo (1996-), with the heavy direct involvement of U.S. clients from Rwanda (Paul Kagame) and Uganda (Yoweri Museveni) in large-scale Congo killings; and Israel’s outbursts in Lebanon (1982 and 2006), to name a few. There were also very deadly wars in Iran, invaded by Saddam Hussein’s Iraq (1980-1988), with Western encouragement and support. And with the stimulus-excuse of 9/11, the U.S. political and “defense” establishment was able to declare a global “War on Terror,” open-ended and still ongoing, to assure that the “Long Peace” would not be interrupted by a conflict that met the Pinkerian standards for a real war. Only one of these wars is mentioned in the BookWorm interview when, in passing, the inability to get warm clothing to soldiers in Afghanistan is noted. My intention in raising Herman and Peterson's book-length refutation Reality Denial, which is freely available as a PDF or as a summary on a webpage, is to emphasise the horrifyingly pervasive dangers of civilisation raised by Shoah and Ethical Loneliness and, more pertinent here, how they are reinforced by the novel. Such subject matter would seem to be difficult to approach given its extent and variety, and Amis is aware of the argument that novels must respect certain boundaries, but regards this is "a philosophical non-starter" because "fiction is freedom, and freedom is indivisible, so there's nowhere that you're forbidden from going". Anyway, he asks, "at what point does something become so terrible that you can't write fiction about it?" Well, The Zone of Interest provides an answer. One of the camp admin staff witnesses an intake of new prisoners, who at this early stage are given a polite reception and deceived into thinking the camp is a kind of sanatorium, only for the façade to be broken when a truck trundles by with the limbs of bodies dangling over the side. Thinking on his feet, the Nazi distracts the arrivees by ordering musicians to start playing: "It was just as I had instinctively sensed: our guests were utterly incapable of absorbing what they had seen." Speaking of which: last year, Middle East Eye reported that the Washington DC-based Physicians for Social Responsibility had released a study concluding that "the death toll from 10 years of the 'War on Terror' since the 9/11 attacks is at least 1.3 million, and could be as high as 2 million" yet observes that "most people have no idea of the true scale of protracted terror wrought in their name". The recent ComRes survey of the British public's awareness of casualties in Iraq confirms the observation. And more relevant to the interview: "Undisputed UN figures show that 1.7 million Iraqi civilians died due to the West’s brutal sanctions regime, half of whom were children. The mass death was seemingly intended. [...] A secret US Defence Intelligence Agency (DIA) document discovered by Professor Thomas Nagy of the School of Business at George Washington University amounted, he said, to “an early blueprint for genocide against the people of Iraq”. With this in mind, read how Martin Amis described some feelings he had following terror attacks on the UK: "There's a definite urge – don't you have it? – to say, 'The Muslim community will have to suffer until it gets its house in order.' What sort of suffering? Not letting them travel. Deportation – further down the road. Curtailing of freedoms. Strip-searching people who look like they're from the Middle East or from Pakistan." While he soon clarified this by saying "I was not 'advocating' anything. 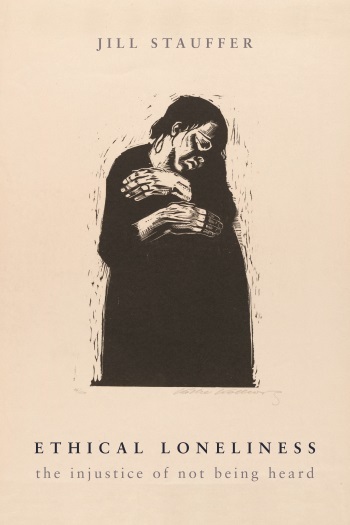 I was conversationally describing an urge – an urge that soon wore off," the contrast with his profound and plainly heartfelt empathy for the victims of the holocaust is stark. The interview draws to a close with a return to the supernatural element in the growth of the camps. When Primo Levi asked a transportation guard why he was not allowed to quench his thirst, he was told: "Here there is no why." Auschwitz was "not human activity and humans cannot really understand it" because "the Nazi hatred was anti-human, really counter-human. It is a hatred that is not in us, it is outside man". he writes, all he does is write, and it does not matter that freedom puts him back into the Bastille after having brought him out, he is the one who understands freedom the best, because he understands that it is a time when the most insane passions can turn into political realities, a time when they have a right to be seen, and are the law. He is also the man for whom death is the greatest passion and the ultimate platitude, who cuts off people's heads the way you cut a head of cabbage, with such great indifference that nothing is more unreal than the death he inflicts, and yet no one has been more acutely aware that death is sovereign, that freedom is death. Writing justifies itself in this Reign of Terror because it promises an answer to its own strange relation to life, gaining from death "the possibility of speaking and the truth of speech". This might be the reason why crime fiction is so popular and may also be justification for pursuing events that are not current to newspaper headlines. I say, "This woman." Hölderlin, Mallarmé, and all poets whose theme is the essence of poetry have felt that the act of naming is disquieting and marvelous. A word may give me its meaning, but first it suppresses it. For me to be able to say, "This woman," I must somehow take her flesh-and-blood reality away from her, cause her to be absent, annihilate her. The word gives me the being, but it gives it to me deprived of being. The word is the absence of that being, its nothingness, what is left of it when it has lost being – the very fact that it does not exist. Sade is thereby the utmost novelist, following writing into its darkness. For all the presumed humanism of the rise of the novel, there is within it this non-human momentum, an Aztec hunger for annihilation, so that people are seen and heard in their great joy and happiness and in their great pain and suffering only when raised like Lazarus from the silence of the tomb, accompanied by the rhapsodic chants of humanist critics. A recent example of how the novel seeks to approach socially pressing issues is the 2015 winner of the PEN/Faulkner Award for Fiction, Preparation for the Next Life by Atticus Lish, which follows the lives and thoughts of two people, Zou Lei, a Muslim woman from China illegally resident in the US and living precariously on fringes of society, and Skinner, a veteran of the Iraq war suffering from PTSD and wandering in New York, with whom she has a relationship. 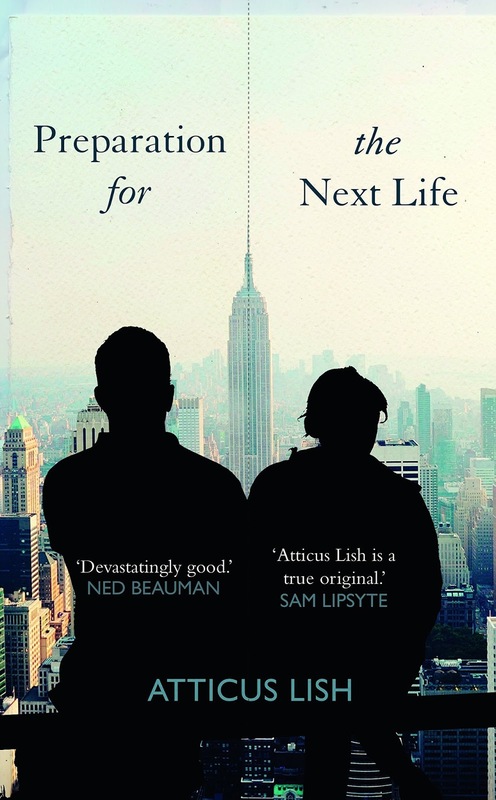 The response from readers has been almost universally positive: "a masterpiece of empathetic characterization" says one, a "beautifully grim depiction of life at the bottom" says another, one that "stays true and honest to real life" and a "really powerful novel that shows us people who we don't see a lot of in literature", while the Guardian says that Lish's "tough lyricism ultimately works to dissolve the barrier between book and reader, co-opting us into a great, multi-ethnic nomadic clan". By coincidence, Michael Silverblatt read it too and says it contains "transcendental writing." It is certainly disturbing taken at face value like those readers above, but also disturbing for how such revelations and consequent concern depend on each character being manipulated like a rat in a maze. (It can only be a coincidence that BF Skinner's surname is present.) Not only are their movements described in detail but those of their inner lives too: "She felt the whole earth traveling across the cosmos" and "Then Skinner came back from wherever he had been and she thought, God was with us." How does the author know what they were feeling or thinking? A naïve question of course, given this is how the majority of novels proceed, but this is not without a troubling precedent, as Blanchot says of the Terror: "No one has a right to a private life any longer, everything is public and the most guilty person is the suspect – the person who has a secret, who keeps a thought, an intimacy to himself". Broadway in the daylight. People streaming out of the subway, moving in clusters that broke apart into fragments and passed through other columns of people like a strainer. He smelled pretzels. A black Denali with the driver’s hand visible, resting on the steering wheel, an athlete’s hand, an expensive watch. All the girls wore Eskimo boots. Their hair bounced behind them. There were so many it was unbelievable. It should be made clear that such writing led one writer to the Nobel Prize, so any negativity implied here applies to a culture in which imaginative empathy has become speaking for rather than listening to, with the flights of transcendence swooping majestically like reconnaissance aircraft over a foreign land prior to an invasion. These may be novels seeking to put into words what previously has not been put into words, but whose words are they? As I said at the beginning, Shoah interviews one scholar, Raul Hilberg, an expert on the bureaucracy and logistics of the Nazi machine, and what he says is worth noting when thinking about this dominant mode of fiction. He speaks of the reliance on past experience for administration of anti-Jewish policy until, that is, they had to go beyond precedence. It was then that the bureaucrats became inventors. For the mass killing "one cannot find a specific document, a specific plan, outline or blueprint which states 'Now the Jews will be killed'. Everything is left to inference from general words". Goering's letter to Heydrich at the end of July 1941 charging him to proceed with the final solution was "an authorisation to invent. It was an authorisation to begin something that was not as yet capable of being put into words". The words in novels are authorised by its form, its genre. You must invent. This is generally assumed to be a gift. What is the alternative? If instead a novel seeks to listen and for that hearing to be meaningful in the sense Stauffer outlines, how might it embed itself in openness and to escape the solipsism of genre? The recent excitement over Reality Hunger and 'creative non-fiction' would suggest it is necessary to include info-dumps in order to back up fictional devices with verifiable facts. Except we have seen how this doesn't explain the unique experience of watching Shoah, as it creates the same noise as lyrical flights around the silence of its object, and merely pays "homage to the superstition of fact", as James Wood wrote contrasting WG Sebald's fiction with his 'factional' counterparts: "For Sebald...facts are indecipherable, and therefore tragic". If fiction and non-fiction appear to sustain themselves in this superstitious, supernatural power and in order to function must act on the authorisation given by generic form, then perhaps literature is also anti-human, counter-human, outside of man; the puppeteer above the puppet. The alternative might be to listen to writing, to challenge its power with infinite patience, the kind showed by Sebald; to apply the great strength of our weakness against instrumental power. Blanchot again: "Let us suppose that literature begins at the moment when literature becomes a question." Thanks for the comment Mattias. I haven't finished one of Murnane's novel yet despite the apparent suit. I have copies of Inland and Barley Patch, so I'll have another go. I find Inland to be the most difficult of his books to get a grip on because of the disconnect between its two parts. Barley Patch is good and introduces his late period after he gave up publishing fiction for a decade. I would also recommend the earlier novella The Plains, which is my favourite and has a slightly mystic Borges-atmosphere, and also the two which came after Barley Patch, A History of Books and A Million Windows. Will Heyward in his review of the latter in Music & Literature said this: "The world can seem, when reading Murnane, as a maze of as yet unmade phenomenal connections. Navigating this maze, and realizing the connections within it, are part of his preoccupation with the act of writing. In writing, these connections are both invented and discovered."